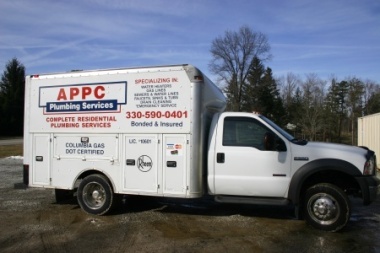 THE APPC PLUMBING SERVICES TEAM IS THERE WHEN YOU NEED THEM-READY TO KEEP THE (HOT AND COLD) WATER FLOWING. As a full-service plumbing company, the bonded, insured and licensed plumbing contractors at APPC can handle virtually all things related to water in the home, including water heater installation and repair; sewer and drain cleaning; gas, water and sewer line repair; bathroom and kitchen plumbing fixture replacement and repairs; garbage disposal replacement; sump pump and grinder pump installation and excavation if needed. APPC Plumbing sells and services leading brands of natural gas, electric, power-vented and tankless water headers. The plumbing contractors at APPC Plumbing treats small jobs, like faucets installation, as well as the big stuff, like clearing a blocked sewage line, with the same level of importance.